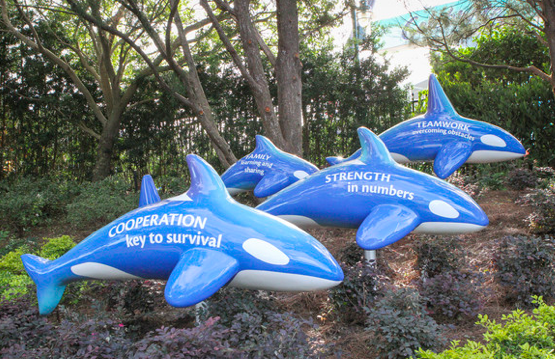 Seaworld Orlando Highlights Training at New "Shamu Up Close". While Shamu Stadium goes through a series of upgrades during Central Florida's slowest season, the team of trainers at Seaworld Orlando are pushing the highlight of their Killer Whales to Training and Education. Trainers talk about animal training and educate the public on the behaviors of the animals both for show and medical purposes. Allowing guests and up close and personal view of Orca's actions, while learning facts about these animals. This new program is slated to last through April but could remain beyond the re-opening of Shamu Stadium. It's located next to Shamu Stadium and viewing remains open between trainer talks, the underwater viewing area is also open during this time. There is no additional charge for "Shamu Up Close" outside of park admission. Renovations to Shamu Stadium include replacing the heavy acrylic panels, repainting of the pool as well as other minor fixes required over time. This standard maintenance has nothing to do with the Blackfish and is normal for the age of the stadium.